Nestled within Italy’s Dolomites mountains—a UNESCO World Heritage site—is ski destination Cortina d'Ampezzo, with a rich thousand-year-old history, and impressive slopes, earning it the honour of hosting many world-class winter events, including the upcoming Alpine Ski World Championships in 2021. It has also made appearances in movies, setting the scene for Roger Moore's cinematic ski chase in James Bond film For Your Eyes Only (1981 ). The beauty of Cortina d'Ampezzo is best enjoyed with a slow ski down Vitelli slope in the Faloria area, where you can take in the breathtaking sights of Dolomites. Celebrities and the well-heeled of society flock to the resort, which also boasts an amazing art, shopping and dining scene for your enjoyment. Nestled in ski destination Cortina is the historic Cristallo Resort & Spa, which has played host to the Winter Olympics, Hollywood film crews such as The Pink Panther, and celebrities such as Frank Sinatra in its century-old history since 1901. Reopening its newly renovated premises just in time for ski season this year, the hotel will be welcoming skiers and holidaymakers with a redesigned lobby, rooms and suites that nod towards the Italian heritage of the property, accented by pale wood panels and wildflower details. Tatler Tip: Besides access to the famed ski slopes of Cortina, guests can also wind down at Cristallo’s Ultimate Spa, where they can enjoy après ski rituals and locally-sourced treatments to detox and relax. Culinary enjoyments come in the form of three cosy restaurants— La Stube 1872, Il Gazebo and La Veranda—each offering a unique experience of Italian cuisine. Perched on the popular Mount Timpanogos is Sundance Resort, a winter destination in Utah, west of United States. 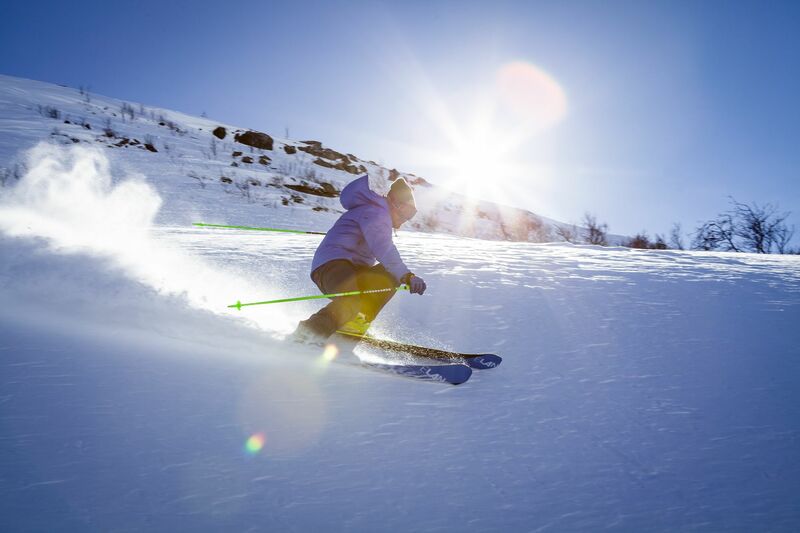 Preferred by advanced skiers, the slopes boast some level of difficulty, with eighty percent made up of intermediate trails and advanced trails. Other winter activities include a 3,870 feet zip tour across Mount Timpanogos at 65 miles per hour, night skiing, snowshoe trails, and a freestyle terrain park. Owned by actor and director Robert Redford (The Great Gatsby, Spy Game), Sundance Resort is committed to promoting the arts and the preservation of nature, engaging in eco-friendly practices. Resort-goers with an artistic streak can spend their free time at the Art Studio, which offers classes from pottery to silversmithing. The mountain resort has its own portfolio of rustic modern lodging, from standard rooms to lofts and mountain homes. At night, retire to a cosy suite decked in fine, wooden furniture, or your very own lodge in the mountains—from two- to seven-bedroom homes to choose from. Tatler Tip: Film aficionados can visit from January 18 to 28, 2018 to catch the Sundance Film Festival, the United States’ largest independent film festival. Where better to enjoy the original ski experience than at the Swiss Alps? St. Moritz, in the Engadin of the eastern Swiss Alps has no shortage of winter sports for the entire family. Elevated at 1,800 metres above sea level, the resort has been a winter destination since the 19th century, with a myriad of activities from skiing and snowboarding, to ice climbing and snow kiting. With 350 kilometres of slopes and trails, advanced skiers will not be disappointed—after all, it was the first city that have hosted the Winter Olympics twice. Wide beginners’ pistes also make it an ideal location to pick up the sport. Steeped in heritage and nostalgic charm is century-old Hotel Waldhaus Sils, awarded historic hotel of the year in 2005. Designed by renowned architect Karl Koller and constructed between 1905 and 1908, the family-run abode is akin to a time capsule that transports you to the grandeur of early 20th century Europe. Tatler Tip: This winter season, guests at Hotel Waldhaus Sils can benefit from the Hotel Ski Pass, which grants access to the regional ski areas at CHF 38 per person per day. And if you are staying for more than four days, your regional pass will be capped at CHF 160—the rest is on the house. If there’s one place to be seen at during the ski season, it’s Courchevel in the French Alps. A prestigious resort village, the resort centre sits at an altitude of 1,747 metres, above its neighbouring villages in Les Trois Vallées, the largest connected ski area in the world. It is also considered the world’s best skiing area by many—former Freeride World Champion Manu Gaidet trained at Courchevel. Other facilities includes a skating rink and fitness centre with gym, sauna and steam room, and you can access more activities in the neighbouring villages below, from surfing to climbing. Dining options on the mountain are aplenty, but if you are in for a gastronomic treat, head to two Michelin-starred Le Chabichou, helmed by Michel Rochedy (Master Chef of France) and Stéphane Buron (Best French Professional, MOF, 2004). If you appreciate five-star hotel services and facilities with the privacy and cosiness of your own apartment, Scott Dunn’s latest addition is the residence for you. The collection of two to five bedroom fully furnished luxury apartments.Three to five-bedroom residences come with fireplaces and wine cellars for added luxury. Parents travelling with their tods can benefit from the on-site Explorers Kids club in the day, or take the evening off with the Stargazers club. The residence also offers the option of a dedicated nanny, guest relations manager or private cook during your stay. Tatler Tip: Head over between February 15 to March 8, 2018 to catch the 16th International Festival of Pyrotechnic Arts, a competition hosted at Courchevel annually that brings together the world’s best pyrotechnicians to light up the winter skies. The first modern ski resort in the United States, Sun Valley in Idaho has a rich history in pioneering ski culture in America and inventing the first chairlift. The resort is home to two mountains—Bald Mountain and Dollar Mountain. Bald Mountain is especially a favourite amongst intermediate to expert skiers, standing at a summit of 2,790 meters and vertical drop of 1,035 meters. Dollar Mountain on the other hand, caters to beginners to lower intermediate skiers with its gentler and treeless terrain. While understated and a little rough around the edges with the Wild West spirit, the luxury resort is a favourite amongst Hollywood stars and socialites, counting Oprah Winfrey, Arnold Schwarzenegger, Tom Hanks, and more amongst its wealthy regulars. The latest hotel to join Sun Valley’s list of premier lodging and accommodations, Limelight Hotel Ketchum. The modern luxury abode boasts 93 rooms, six suites, and for those who appreciate more space, two- to three-bedroom serviced residences. Rooms are spacious and minimally designed, and the vibrant lounge sets the mood for dining, drinks and après ski activities. Tatler Tip: Each week, five guests at Limelight Ketchum can sign up for “Inside Tracks”, a ski program where they can learn tips and know-hows from ski school professionals while exploring Bald Mountain. The program is complimentary, with transportation provided. Immerse yourself in a different culture at Japan’s number one ski destination, made up of four interconnected resorts—Grand Hirafu, Hanazono, Niseko Village and An’nupuri. The terrain is suitable for skiers across levels, with other activities such as snowmobiling, snowshoeing, heli skiing and cat skiing. Known for its bountiful snowfall—averaging to 15 metres of snow every winter—and quality powder snow, Niseko has earned a loyal following of locals and skiers across the globe. The area is also foreigner-friendly, so you’ll find English menus and a wide variety of cuisine to satisfy your palate. What makes Niseko so different from its European counterparts is the rural beauty, heritage and culture of Hokkaido. Indulge in after-ski activities like the locals do—with a soak in the onsen, and a hearty Japanese meal packed with flavours and colours. A luxury seven-bedroom chalet nestled in the heart of Hirafu Village, Hakuchozan is a home away from home. Perfect for families across generations, the property comfortably accommodates up to 16 guests, and is designed to be child and elderly-friendly. The expansive living room, furnished with a fireplace is perfect for cosy gatherings, while children can have fun in the game room that boasts Xbox, Apple TV and a foosball table. For the men—a ‘man cave’ bar with championship shuffleboard table will keep them occupied, while the ladies can take a soak in the outdoor jacuzzi overlooking breathtaking view of Mount Yotei. Guests are also under the care of a dedicated chalet manager, butler, driver and private chef throughout their stay, for a stress-free vacation. Tatler Tip: Experience Niseko’s vibrant dining scene during your stay. The region is especially known for fresh seafood and farm produce. For authentic Japanese cuisine, visit Niseko’s izakaya or sukiyaki, udon and shabu-shabu restaurants. A hidden gem frequented by the well-heeled in French society and celebrities, Megève is the destination for a well-rounded holiday away from crowded pistes and queues. The resort was developed in 1920s in response to Switzerland’s St. Moritz, and retains that old-fashioned charm to this day. A cobbled market square, horse-drawn carriages, and ancient chapels dot the village, which boasts an outdoor ice rink, and a fine selection of art galleries, boutiques and dining options for vacationers. While the mountains at Megève lean on the low side—the resort stands at a medium altitude of 1100m—it makes a good place for novice to advanced skiers, and does well in bad weather conditions with its gentle climate and slopes—from which you can enjoy views of the Mont Blanc. Debuting this ski season is Four Seasons Hotel Megève, a 55-room slope-side abode inspired by the traditional Alpine mountain resort. With Four Seasons’ reputation for luxury and class, the hotel is set to be a worthy competitor amongst the swanky hotels in the resort—it will be Megève's first hotel to offer direct access to the Mont d'Arbois slopes, and the largest spa in the French Alps, spanning 900 square metres. Local favourite and two-Michelin starred Le 1920 restaurant will also be opening its doors at the new location, with seasonal delights crafted by Chef Julien Gatillon. Tatler Tip: To get the most of the French Alps, skiers can participate in Four Seasons Hotel Megève’s Helicopter Ski Safari packages, with itineraries that transports guests to the best ski slopes across the French Alps. Enjoy stunning views of the Mont Blanc and its surrounding mountains as you soar above the Alps. The packages are available from December 15, 2017 until April 15, 2018. Known to be one of America’s best ski resorts, Beaver Creek in Colorado is an upscale ski destination that comprises of three interconnected mountains, giving skiers and snowboarders access to 1,815 acres of terrain, and 150 trails, serviced by 25 lifts. The varied terrain is friendly for novice to advanced skiers and boarders, and has plenty to offer, whether you are into alpine skiing or chutes. The resort also boasts the one of the best ski schools, with group or private programmes are available for all ages and levels. When you’re not out running in the snow, the Beaver Creek village is also a vibrant outlet for dining, shopping and lodging. Little touches, like heated walkways and escalators that link between shops, art galleries and restaurants, and ski-in ski-out accommodations add to the luxury of the resort. Nestled at the base of Beaver Creek Mountain—a few hundred yards from Beaver Creek Ski Resort’s lifts—is its only all-suite property, offering lodgers plenty of space with a living room, bedroom, fireplace, whirlpool bath and kitchenette.Three-bedroom suites are also available for families. On days in, guests at Beaver Creek Lodge can take a dip in the heated outdoor pool, visit the spa and sauna, or immerse themselves at the art gallery.The lodge also has an on-site rental centre for easy access to ski and snowboarding equipment. Tatler Tip: Ski enthusiasts can take advantage of Beaver Creek Lodge’s Demo Ski package, which gives lodgers an option to try different types of ski rentals each day, at a discounted price. On the island of Honshu in the Japanese Alps of Nagano is Hakuba Happo-one, one of Japan’s biggest ski resorts and the most famous amongst the other ski resorts—there are 11 in total—in Hakuba Valley. With plenty of snowfall, powder-chasers are guaranteed to enjoy the fresh and bare tracks. While there are varied trails for skiers and boarders across difficulties, intermediate to expert athletes will especially be kept occupied exploring the terrain. The resort played host to the 1998 Winter Olympics, where it was the site of the alpine skiing downhill, super giant slalom, and combined slalom events. If you are not looking to crash the slopes everyday, Hoshino Resorts Kai Alps is a great place to spend your vacation, with close proximity to the slopes of Hakuba, as well as landmarks to take in the beautiful sights of Nagano. The hot spring inn immerses guests in the authentic Japanese experience, with yukata provided for guests to lounge in, and Japanese cuisine served for every meal. The inn also offers foreigners the opportunity to experience rural Japan—by sitting in a traditional sunken hearth and enjoying heated sake with grilled snacks. Tatler Tip: While Hoshino Resorts Kai Alps offers both indoor and outdoor baths, take a dip in the latter to enjoy breathtaking views of the nearby mountains. Cool off at the Yuagari Lounge after your bath, where you can sip on tea while gazing out upon the clear streams. Extending across four mountains with unique terrains—Snowmass, Aspen Mountain, Aspen Highlands and Buttermilk—Aspen/Snowmass in Colorado spans more than 5,300 acres, so you’ll never have to ski the same trail twice. For families, Buttermilk is a great choice with its low altitude, beginner slopes and two children’s centre for your Tatlings to get their start on skiing. The mountain’s terrain park is also the site of the Winter X Games, but daredevils can find also find their thrill on the cliffs, chutes, drops and steeps of Snowmass (the biggest mountain of the four). Expert skiers, on the other hand, should not miss the steep Aspen Mountain. Aspen may have its share of glitzy luxury hotels, but Little Nell has definitely earned its stripes with its exquisite service, design, and dining scene, well thought out for its guest’s experience. It is the only ski-in-ski-out hotel in the heart of Aspen and a hub for après-ski activities, connecting locals and tourists alike. Dining choices include five-star casual dining spot Element 47—serving farm-fresh local produce and an extensive collection of wines in its cellar—and the effortlessly glamorous Ajax Tavern for casual fine-dining during lunch and dinner. The hotel’s 52 guest rooms, 26 premium guest rooms, eight suites and six signature suites are designed by Chicago designer Holly Hunt, styled for the comfort of guests for a good night’s rest and each overlooking a stunning view. Tatler Tip: The best way to enjoy Little Nell is by checking in to one of its six luxury suites, inspired and named after Aspen’s celebrated personalities. A night’s stay here is highly coveted, so be sure to book in advance, especially during peak travel periods. Reservations cannot be done online, and are only available through phone call.